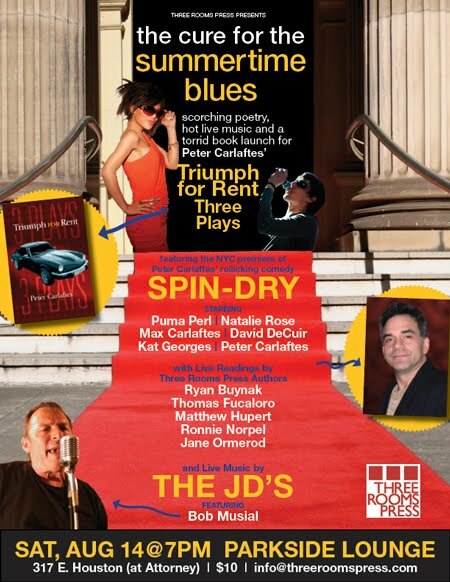 This Saturday, Aug. 14, Three Rooms Press presents a sizzling book launch for Peter Carlaftes‘ latest release, Triumph for Rent: 3 Plays, which will feature a torrid New York premiere of his uproarious play, Spin-Dry, along with poetry and live music. Spin-Dry is a rollicking comedy anchored at Second Wind: A designer celebrity rehab center, set smack-dab in the 90s, where MTV mavens rub elbows with rockers and movie stars. The wild ride features Sara Kinetic (her mom died at Altamont; her dad in outer space), as she weaves her way through trysts and turns to get back on top of her game. The play stars Puma Perl, David DeCuir, Natalie Rose, Max Carlaftes, Kat Georges & Peter Carlaftes. Also on tap will be sizzling readings from current and upcoming Three Rooms Press authors Jane Ormerod, Matthew Hupert, Thomas Fucaloro, Ryan Buynak, and Ronnie Norpel. 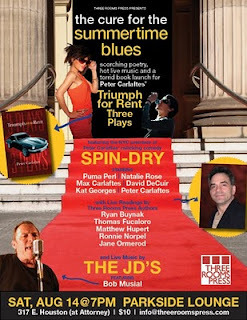 In addition, the beloved downtown r’n’b band The JD’s (featuring Bob Musial) will round things out with a swinging set of smokin’ tunes. Doors open 6:45. Show starts at 7:00. Tickets $10 at the door. Parkside Lounge is at 317 E. Houston (at Attorney). RSVP: info@threeroomspress.com. ABOUT PETER CARLAFTES: Peter Carlaftes began his theatrical career on the playgrounds of the Bronx, and after seeing the world, branched out to Manhattan and beyond. He served as artistic director of San Francisco’s Marilyn Monroe Memorial Theater from 1993-2000. Nine of his plays have been staged, to critical acclaim, among them Anity, Frontier A-Go-Go, Spin-Dry and Closure. He also created and staged a deconstruction of Knut Hamsun’s classic novel Hunger, and created and starred in a one-man rendition of Harold Pinter’s The Homecoming. He has recently written and performed his solo work, Lenny Bruce: Dead & Well, and starred in numerous Off-Broadway plays including Arsenic & Old Lace and Barefoot in the Park, and will soon be seen in a revival of the 1995 Stephen Adly Guirgis black comedy, Den of Thieves.In 2010, he’s authored three books on Three Rooms Press, including A Year on Facebook (humor), DrunkYard Dog (poetry) and Triumph for Rent: 3 Plays. ABOUT THREE ROOMS PRESS: Since 1993, Three Rooms Press has been a leading voice in the independent poetry, literature and dramatic fields, publishing more than 30 books of poetry, theater, and literary fiction, with a focus on the work of the best current New York underground writers. In addition, Three Rooms Press produces and promotes a variety of events; in the past 16 years it has staged more than 400 events in San Francisco, New York, Los Angeles, Philadelphia, Las Vegas and Europe.